Sturdy construction, durability and corrosion resistance are some of the attributes that make our Brass Vessels highly popular. 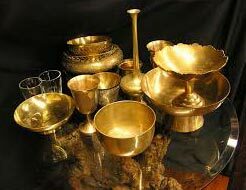 The name of our company surfaces prominently among the trusted Exporters and Suppliers of Brass Vessels. When it comes to delivery, we go for those shipment modes that enable us to deliver retail as well as bulk orders for Brass Vessels within the stipulated time frame.